Wilco at the Orpheum Theatre | What's Up Mann? Going to a Wilco gig on Super Bowl Sunday is like stepping into an alternate reality. Prior to the veteran Chicago alt-rock group’s show, Granville Street was experiencing Saturday-night levels of bedlam as jersey-wearing yahoos, sozzled on Jägerbombs, spilled into the streets to celebrate America’s high holiday. Inside the Orpheum Theatre, it was as if the game never took place, even though the much-loved band—fronted by the even more-loved Jeff Tweedy—hit the stage two hours after the New York Giants had claimed the Vince Lombardi Trophy. The crowd wasn’t made up of kids who only discovered Wilco after 2011’s The Whole Love bagged a Grammy nomination for best rock album. No, the audience was largely long-timers who’ve been around since the band’s inception, the seats packed with hip grey hairs and cool dads of all kinds. Though there wasn’t a Nudie suit in the building, there was a guy in a tie-dyed Grateful Dead shirt who looked like Wavy Gravy if he attended business school and hit the gym. This was Wilco’s first show in Vancouver since a free outdoor concert during the 2010 Olympic Winter Games that, presumably, older fans didn’t brave the rain and massive lineup to get into. Factor in that there hasn’t been this much hype for the band since 2002’s Yankee Hotel Foxtrot, and it was unlikely the hungry crowd was going home unhappy. On just the third song in, “Art of Almost”, the love-in was on. How good was it when they launched into that number from The Whole Love? Even the ladies behind me stopped screeching at everyone to sit down so they could see the show. They got off their asses, stood with the rest of us, and started having fun because we were in the midst of a psychedelic freakout. The visuals quickly got trippy enough to make you think you were about to lapse into a K-hole and you just knew that somewhere in the audience, Wavy Gravy, CA, was having the time of his life. Wilco played all the songs—“Heavy Metal Drummer”, “Impossible Germany”, and the current single “Dawned on Me”—that those south of 30 would know. At the same time the band was very aware of the old-school contingent in the audience, and dug deep into its catalogue. A third of the two-hour set was pre-Yankee Hotel Foxtrot, with the final three tracks of the evening—“Red-Eyed and Blue”, “I Got You”, and “Outtasite (Outta Mind)”—coming from Wilco’s second album, 1996’s Being There. Tweedy and those other guys even tapped into their 1998 collaboration with Billy Bragg, Mermaid Avenue, the singer musing that it would be great if “ ‘Canada’ was pronounced ‘Ca-nah-dee-ah’ ” so he could incorporate it into the song “California Stars”. 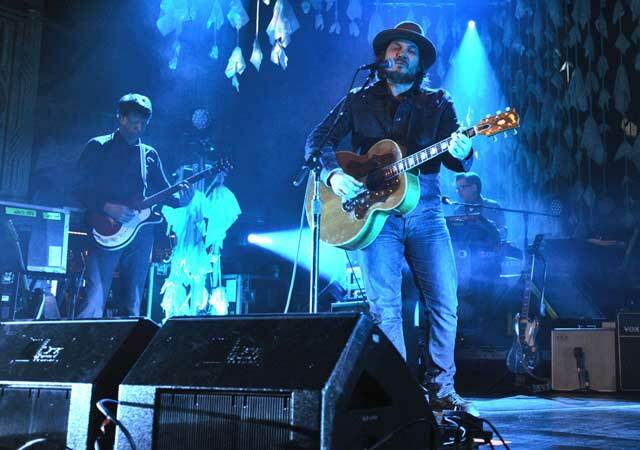 Wilco performed that song as “Ca-nah-dee-ah Stars” for a verse, then Tweedy reverted back to the original lyrics and Woody Guthrie’s ashes were once again at peace. Though addressing the faithful infrequently, the bearded singer appeared to be in good spirits. At one point in the show, he playfully singled out an interloper in the crowd—a woman in a New York Giants jersey. “You must be excited. Your favourite sportsball team won today,” he kidded. For fans of Wilco, this was an inarguably memorable show. But for that woman in the Giants jersey, Sunday, February 5, 2012, was a day she won’t ever forget.